This product page has been automatically translated. If you have any questions, do not hesitate to contact us. "In high-level competitions, precision in brake control is paramount at all times. The perfect perception of the pressure and the resulting braking response gives the necessary confidence for. Approach more difficult tracks on road and track. Accossato brake pipe kits are assembled according to the strict specifications, essential to ensure optimum performance. And for each type of use. Accossato brake lines have the homologation dekra 201126026. Made of steel braided with teflon core of stainless steel fittings. Our brake hose kit eliminates the braking effect that rubbery normally perceives in case of intensive use. In this way, you maintain all the efficiency and maximum safety in the performance that the product is able to guarantee. Especially in case of greater need. The use of stainless steel as a material to make the inner braid and accessories. Both the corrosion-abrasion of the product. 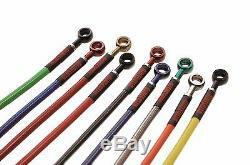 Accossato brake hose kits are supplied with sheath available in 20 colors: black, anthracite, black, neon, red neon, silver, red, pink, kawasaki green. Neon green, neon orange, purple, orange, yellow, white, transparent, blue denim, yamaha blue, gold, neon yellow, neon. When the kit needed, 6 painted fittings are available different colors: black, blue, silver, red, green and gold. Accossato brake hose kits are available in 4 configurations. S-1 standard: identical to the original configuration tubes development. 2 f-direct: Each tube connects the pump to each caliper front and rear brakes. 3 or above the mudguard: front tube connects the front brake caliper right while another tube connects the caliper from right to left. Accossato brake hose kits use steel fittings and have all the components needed for installation. Steel screws and copper washers; they are also accompanied by instructions for use and stickers. When the kit allows, accossato also offers a range of colored stainless steel fittings: treated by galvanic bath. Have an even color, vibrant colors and excellent protection against ultraviolet rays that rather ruins aluminum or alloy fittings. Fittings are available in the following colors: natural, red, blue, gold, green, black, thus offering an excellent choice without compromising security. All brake hose kits come complete with all parts (screws and washers). Attention: after purchase indicating the coloring and dyeing of the sheath connections. Without this information, we can not go to production. Having an item that is hourly produced on the customer's specific requirements, it is possible that sometimes the waiting time before shipment will stretch slightly. In case of emergency prevent before buying. Caution: being a product that the customer is free to customize both about the color sheath and that it is with regard to the color fittings. The kit once received can not be replaced or modified (returned). Obviously, the refund is guaranteed if there were technical problems of assembly, where in this case directly the company accossato. If there are any problems concerning the installation or other, do not be alarmed, but contact us, that we will try together of farm accossato de risolovere. The problem as soon as possible. The item "set brake hose braid accossato yamaha quad yfm700 raptor 2006-2008" is on sale since Monday, October 15, 2018. It is in the category "auto, motorcycle parts, accessories \ motorcycle \ accessories \ other". The seller is "mggroupmoto" and is located in villastellone.